All holiday Notice to be shown every year. 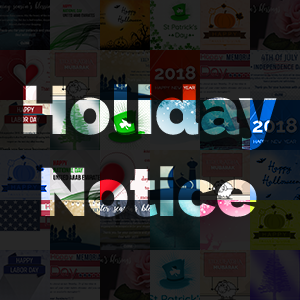 Holiday notice & effects Plugin V2 allows you to change various colorful snowflake on your whole site related to different festival & seasons for showing relavant snowflakes at front side of nopCommerce store. You are able to show different size, color & image of the snowflake which suites to your existing nopCommerce theme during different festival. Our plugin lets you show holiday notice on the website. This multipurpose notice can be used to convey visitors that your store will be closed for few day or let them know the last date of order to receive their gifts before any festival & seasons. so you have multiple ways to utilize Holiday Notice. Here, we provide you attractive readymade message template for any season & festival. so you can use them during that festival for your nopCommerce store.